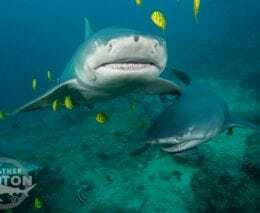 5 Nights, 10 Dives including 4 Shark Dives! Beqa Lagoon is the world renowned home of the Shark Dive, and all three dive centres in this area offer phenomenal shark diving experiences. Choose from the Shark Dive at The Bistro or the Big Fish Experience where you can see Tigers at the Cathedral with Beqa Lagoon Resort. Have a look on earth view in Google maps, and you’ll see just how big the reef around the lagoon is. 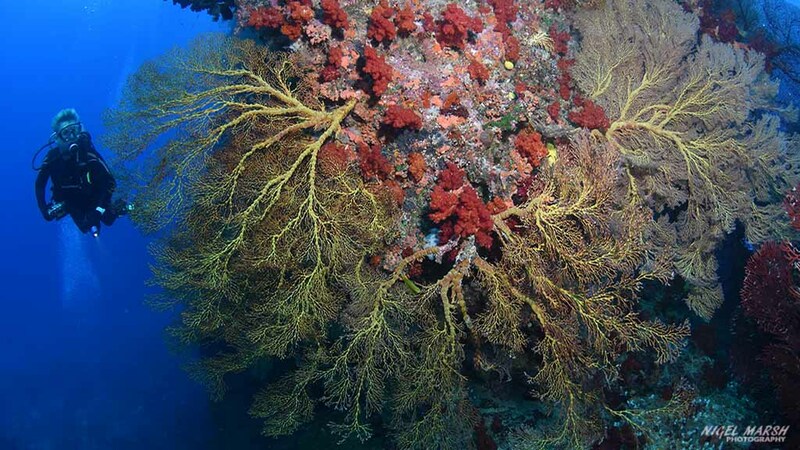 Its 144 km of coral reef is formed around an extinct volcano crater. 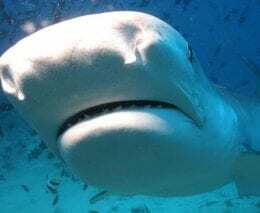 There are about 30 odd dive sites found all along the reef, and some in the middle of the lagoon – including a wreck – all within an easy boat trip from the resorts – each of which have their own jetties adjacent the resort. 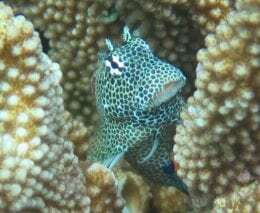 You will find everything from carpets of anemones, to clusters of coral heads, walls to wrecks, and a few hundred species of fish from tiger sharks to clown triggers. 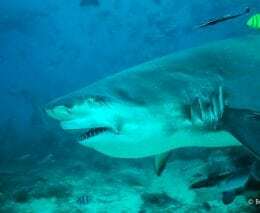 Many divers come for the unique Shark Dive experience, but you’d be crazy to book for anything less than a week if you want to do justice to the diverse dive sites on offer. Pacific Harbour is also base camp for many of the country’s most exciting activities, including white-water rafting through a breathtaking gorge, world-class surfing, and idyllic waterfall tours. Access to Beqa Lagoon is at Pacific Harbour, on the south coast of Viti Levu, about a 2½ hour scenic drive on the Queens Highway from Nadi, and about 30 minutes from Suva. Aqua-Trek Beqa is a PADI Dive Centre located in the grounds of Club Oceanus Resort, a hip new waterfront property. Aqua-Trek provides dive services to guests staying at any of the local hotels and resorts on the main island of Viti Levu. Daily dives to Beqa Lagoon are offered as well as a full spectrum of PADI courses from Discover Scuba up to the Divemaster level. There are more than 20 excellent dive sites within a short boat ride from Pacific Harbour, and their 33-foot custom-built dive vessel will carry you to them in comfort and style. Aqua-Sport is one of the fasted vessels in the area. That means less time traveling and more time relaxing and having fun! 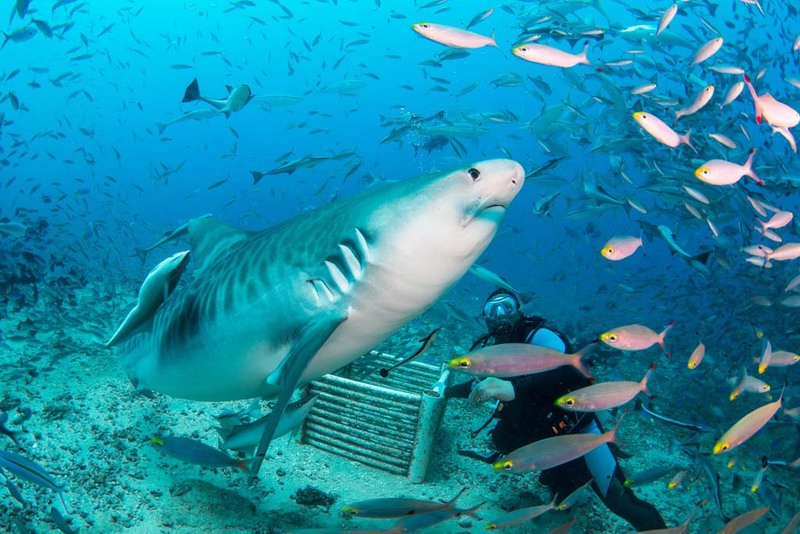 Beqa Adventure Divers is a PADI Dive resort offering some of the best shark diving the world has to offer. Their modern dive centre, located at Lagoon Resort in Pacific Harbour, fuses Fijian hospitality with world class diving facilities. 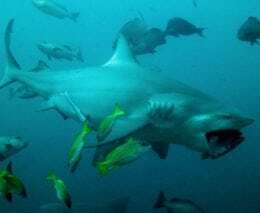 The incredible shark diving, and reef and wreck dive sites of Beqa Lagoon are but a short boat ride from their jetty. 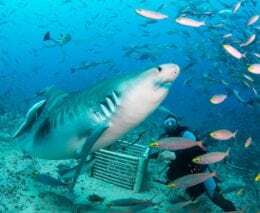 Beqa Lagoon diving has its own private Shark Dive known as the ‘Big Fish Encounter’, a dive that teases you with huge groupers, bait balls of massive Trevally, and the chance of being up close and personal with nine different species of sharks. Beqa Lagoon Resort is a PADI 5 Star Resort offering everything from entry level Discover Scuba Diving right up to professional courses such as PADI Assistant Instructor. They also offer PADI specialty courses such as Enriched Air Nitrox, so that after a day’s training you’ll be able to take advantage of the Nitrox available on any dive. You can read more about them via the link below. 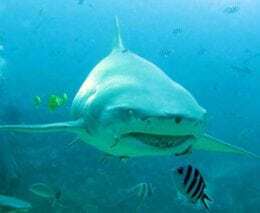 The shark diving in Beqa Lagoon is among Fiji’s most renowned marine experience. 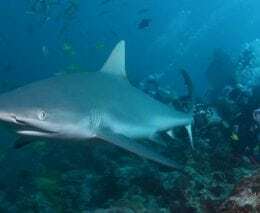 Silvertips, grey reef, whitetip reef, blacktip reef, sicklefin lemons, and tawny nurse sharks as well as large bull and occasional tiger sharks come to feed on the fish bait provided at a depth of 25 to 30m on the reef ledge while divers observe from a safe distance. The sites in Beqa are long established and very well managed. 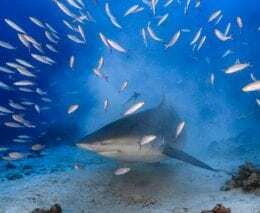 Points to note: because of the depth, all divers must be certified, and the shark dives don’t happen every day – but that’s not a problem as there are dozens of other great dive sites available around the Lagoon. There’s excellent wreck-diving at four purpose-sunk Taiwanese trawlers, each roughly 33m long. The first was sunk in the late-1990s. The wrecks are home to schools of barracuda, pipefish, a giant camouflaging frogfish, stonefish, lionfish, leaf scorpion fish, and moray eels. 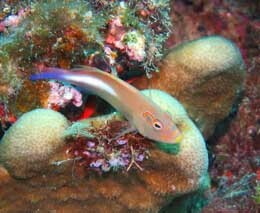 Soft coral dives take place at more than 20 sites around Pacific Harbour. Highlights here include large pinnacle clusters, which give divers the impression of walking between buildings, and the rare blue ribbon eel. 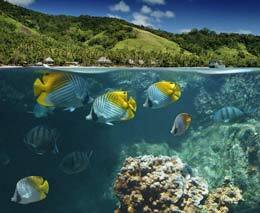 Beqa Lagoon Resort is a dive resort on Beqa Island which sits within Beqa Lagoon. 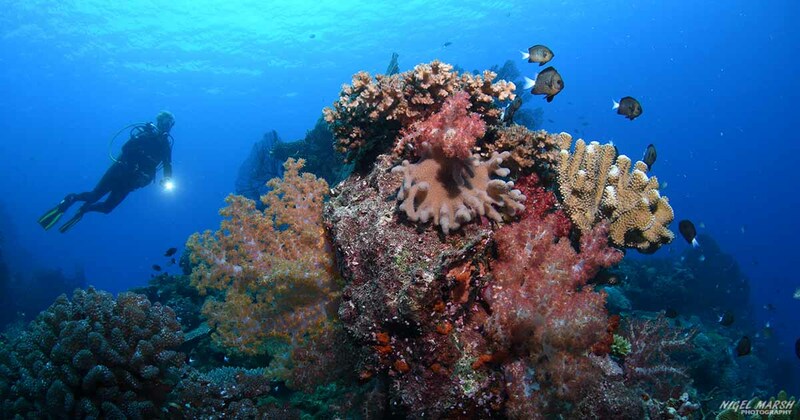 It is about 10 km offshore of the main island of Viti Levu and is surrounded by its own fringing reef system. Beqa Lagoon Resort is pretty much a divers’ resort, with four vessels capable of taking 50+ divers out to its many sites daily. There are 25 bures tucked away discretely around the resort. 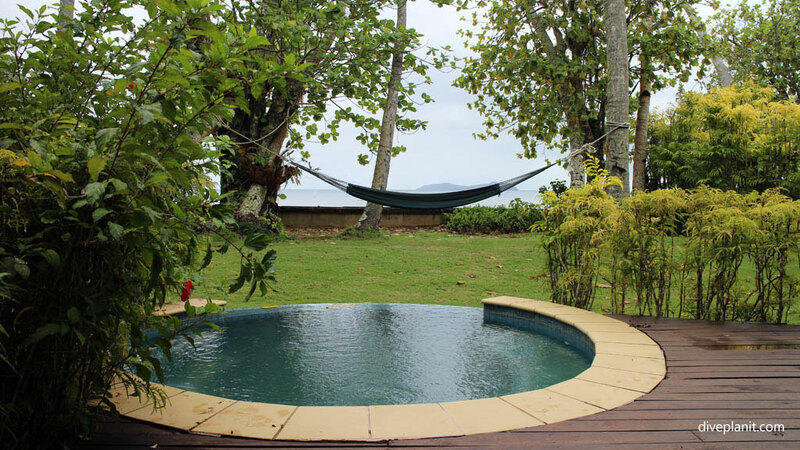 Each with private deck, plunge pool and garden outside, and spacious luxury inside: tastefully decorated in traditional Fijian Island style, and fully equipped with Wifi and a fully stock mini-bar. You can open the fully screened slats and enjoy the cooling ocean breeze or use ceiling fan or air-con. The rooms are supplied with fresh spring water – straight from the mountains of Beqa. There are King and Queen Beds in each room, as well as leather sofa and chairs. All the bures are within a minute’s walk of the main house and dive centre through manicured grounds. Lalati Resort & Spa is another great resort to enjoy Fijian hospitality away from the crowds. 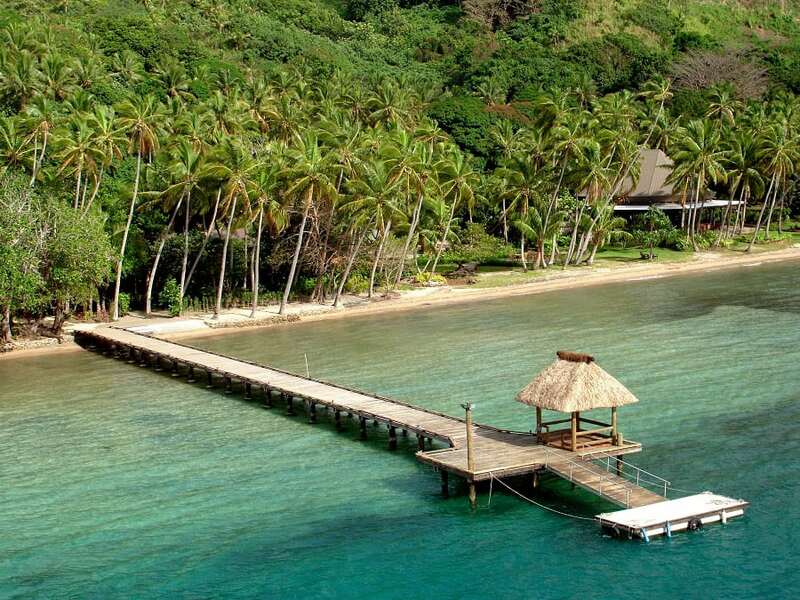 Lalati Resort is nestled on the shores of another secluded island in Beqa Lagoon. Sitting on the picturesque lagoon in the heart of Pacific Harbour, each of Lagoon Resort‘s spacious 23 guest rooms features air-conditioning and ceiling fans, a TV and an Italian marble bathroom. The resort also offers excellent conference and wedding packages … just saying … if you were a diver wanting a wedding package in Fiji – it should be a serious option. This 3-star resort offers Beachfront Bures just 18m from the surf, which sleep up to seven, Standard Bures which sleep up to four and include outdoor showers, and the 20-bed dorm-bure which includes a towel and modern bathroom facilities. The restaurant serves hearty portions from an eclectic menu. A two-course Continental breakfast and free Internet WiFi are big pluses. Uprising Beach Resort is an excellent choice for the young and young at heart. Pacific Harbour is base camp for many of the country’s most exciting activities, including white-water rafting through a breathtaking gorge, world-class surfing, and idyllic waterfall tours. Here are just a couple of examples. Those listed under the Coral Coast in Sigatoka are also doable as day trips. Spend a full day deep in Fiji’s tropical highlands: the Upper Navua River cuts an emerald ribbon through black, volcanic gorges. Set out for a rafting adventure down this pristine waterway, tackling Class II and III rapids and floating through tranquil stretches to take in the surrounding jungle scenery. A combination of full day cultural tour and cruisey river rafting down the lower, shallower end of the River Navua. Under the supervision of trained guides, soar down 16 different zip-lines through the treetops high above the jungle canopy. 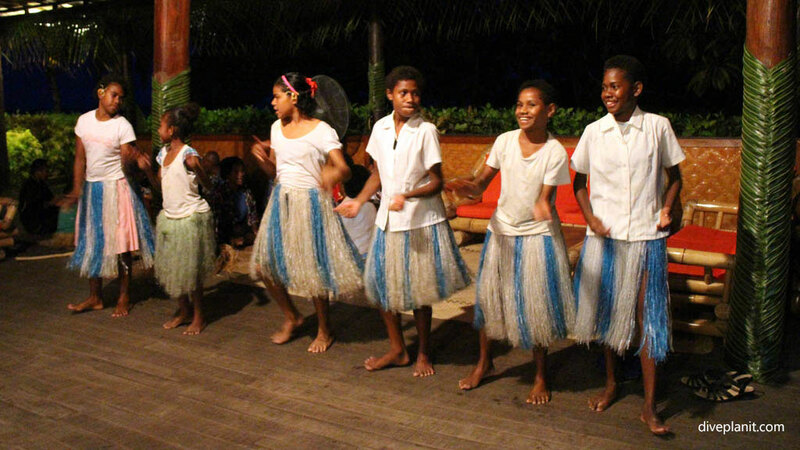 Arts Village Fiji’s largest-scale cultural attraction includes performances, restaurants, and a shopping centre. Around the resort there are invariably no end of water sports, spa treatments and increasing – a cooking class. For those who enjoy Kokoda, you can join a class to see how it’s made, including the tricky bit with the coconut – for those of us who have almost forgotten that coconut milk doesn’t just come in cans! And, it wouldn’t be Fiji if there wasn’t a Lomo (feast) and Meke (dance performance) once each week – make sure you don’t miss it. Nadi is the international airport on Fiji, and Pacific Harbour is about a 2½ hour scenic drive on the Queens Highway along the southern coast of Viti Levu. 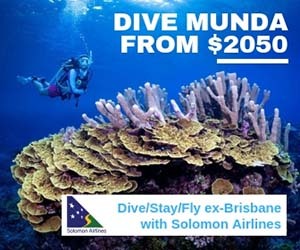 Though Suva is only about a 30 minute drive away, at the time of writing, the domestic connection does not work out much better than a road transfer from Nadi. 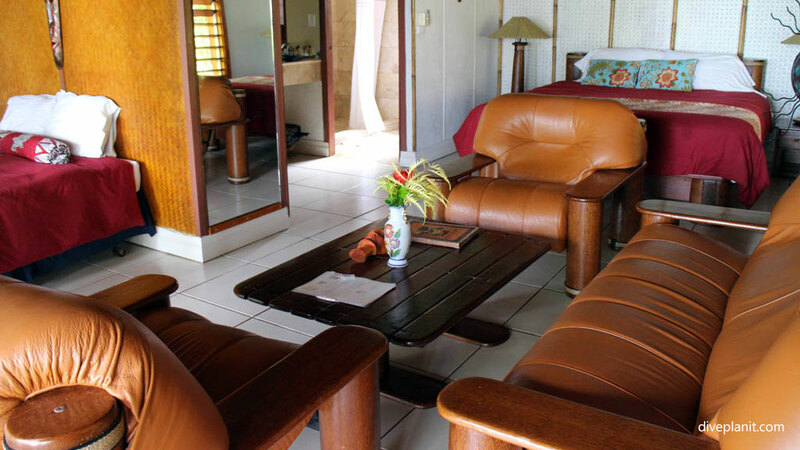 The Beqa Lagoon Resort (and the Lalati Resort & Spa) is a 30 minute boat ride across the lagoon from Pacific Harbour, and as the Beqa Lagoon reef practically abuts the mainland’s Rovodrau Bay reef, the transfer is pretty smooth. Check with the resorts, the transfer can be included as part of a package but tends not to run ‘after hours’. In the Fijian winter, May to October, if you feel the cold, plan to dive in a 5mm suit, or take a sharkskin to wear under a 3mm suit. Bring a hard drive! I shot +20Gb in just 6 dives.